The cardiac scan is a simple non-invasive, painless procedure used for detection of coronary artery disease. Multiple images of the heart will be acquired, with millisecond slices, using ECG gating. A relatively small bolus of iodinated contrast is used. Due to the state of the art 128 slice dual energy CT, radiation doses delivered to the patients are kept to a minimum ( <1 millisievert CT coronary angiograms are possible at our centre). A radiologist will interpret these images to determine the degree, or absence, of narrowing of the arteries. 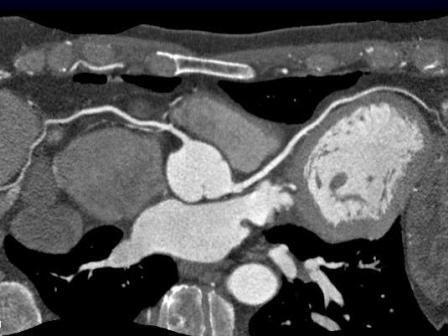 The radiologist will also ascertain the amount of calcified plaque present in the arteries (coronary calcium score). The negative predictive value of this scan is over 99%. .
No preparation is required but caffeinated drinks should be avoided at least 6 hours prior to the scan. All medications taken should be disclosed prior to the scan. If you have any allergies, especially to iodine, or if you are pregnant, please inform the radiographer or receptionist when you make your booking and before any scans are taken. .
You will be required to lie in our CT scanner for approximately 10 minutes. A contrast medium will be injected via a drip into your arm. The contrast medium enhances visualisation and assists the radiologist in interpreting your scan. During the procedure you will be required to hold your breath for approximately 15 seconds at a time as images are acquired. There are no post-procedure side effects and you may continue normal activity. If you have had the iodine contrast medium injected for the first time, you will be required to wait in our waiting room for 20 minutes after the procedure just to ensure you don’t present with an allergic reaction..